Teaching in Thailand: ready for a roller coaster ride? Insert friend/family member/etc. : what are you majoring in? Insert friend/family member/etc. : Oh so you’re going to be a teacher? Fast forward to less than a full year after graduation, and I’m looking online and quickly commuting to teaching English in Thailand. At that point, I have to admit that I wasn’t as focused on the teaching aspect of things. Teaching served as a means for travel and new experiences, I had no idea that I would enjoy it so much. Teaching experiences in Thailand are like snowflakes, they’re all extremely different. Younger kids to older kids, 20 different classes a week and hundreds of students to 1 home room class of 20 or so, rural schools with country farm children to fancy internationals schools with privileged kids. My agency placed me in a Christian Montessori school in south Thailand teaching a class of about 20 kindergarteners, ages 3-6. My first few weeks were a blur of being confused about what I should be doing, having no control over the kids whatsoever, getting frustrated with the language barrier and just feeling completely useless. Fortunately, my coordinator and co-workers were patient with me. Gradually I learned the ins and outs of teaching kindergarteners who speak a different language. Discipline is one game changer. I remember the first student I put on “the chair”, a then 3-year-old named Proong. Not going to lie, I felt completely unsure of myself and mean for doing so but I knew something had to be done. When I noticed how well-behaved he was following that moment… Lightbulb! I get it now. Discipline still isn’t my strong suit; I’m very thankful to have a co-teacher who is awesome at it and has the full respect of the students. I’m working my way there. Even as teachers, we’re the ones continuing to learn too. Posted on February 22, 2016 February 18, 2016 Leave a comment on Teaching in Thailand: ready for a roller coaster ride? When you’re backpacking Southeast Asia, the flexibility of your plans make you prone to a host of unexpected adventures. My most notable albeit challenging thus far: climbing 3,726 m to the summit of the volcanically active mount Rinjani in Lombok, Indonesia. After teaching in Bangkok, gallivanting around Myanmar, water-fighting my way through Chiang Mai, spending way too much time in Pai, traveling 18 hours on the road back to Bangkok, and getting reamed out by the head of immigration lady at Don Mueang Airport, the idea of spending a relaxing 5 days doing yoga in Ubud, Bali seemed very welcoming. Upon learning that my Phatthalung friends were passing through Ubud at the same time, I had an inkling those plans were apt to change. Me: “What are you guys planning on doing the next few days”? 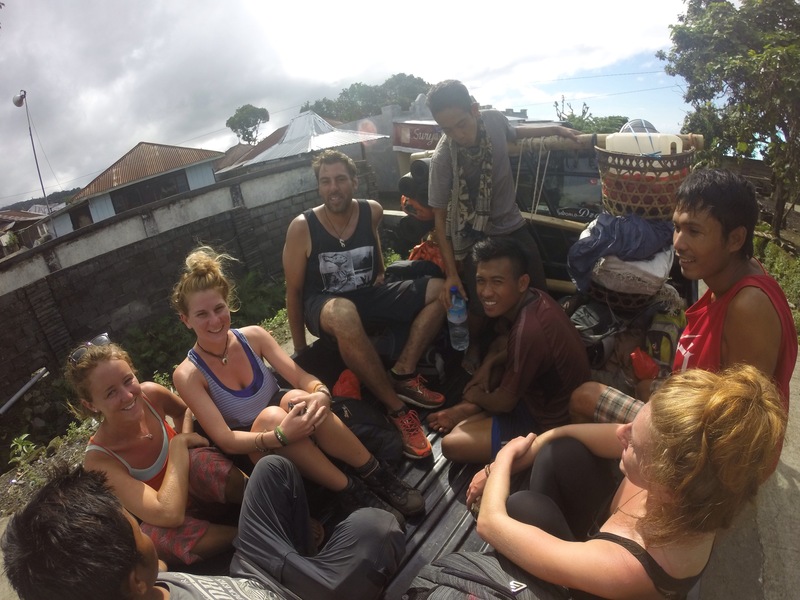 Naomi: “We booked a ferry over to Lombok for tomorrow, we want to do this cool trek I heard about. Wanna join”? Naomi and Rachel were soon moving to Australia so the answer to the debate between spending time alone or with them was obvious. Three days later, after bargaining with a handful of trekking companies and laying down almost 2 million rupiah each, we were on a 5am van winding through the rice patties and relentless rain towards base camp in Senaru Village. Indonesian coffee soon became my new best friend. We were greeted by our guide, Andy, our 4 porters, and fellow Trekkers; Felix from Montreal and a friendly Dutch couple. My friends and I had assumed primarily beach weather for our travels so we made sure to sign on with a company that would provide jackets and appropriate footwear. When we reminded them of this agreement, they tossed us some used sweatshirts, plastic ponchos and dilapidated hiking boots. Better than nothing I guess. We would realize over the duration of the trek that it’s the norm to plan and prepare for it sometimes years in advance(one climber I spoke to had been waiting 15 years). The climbers we saw on the chilly last leg to the summit looked like they were straight out of a Patagonia catalogue; headlamps, poles and all. Our slipshod layering of sweatshirts and elephant pants, and use of cell phone light paled in comparison. 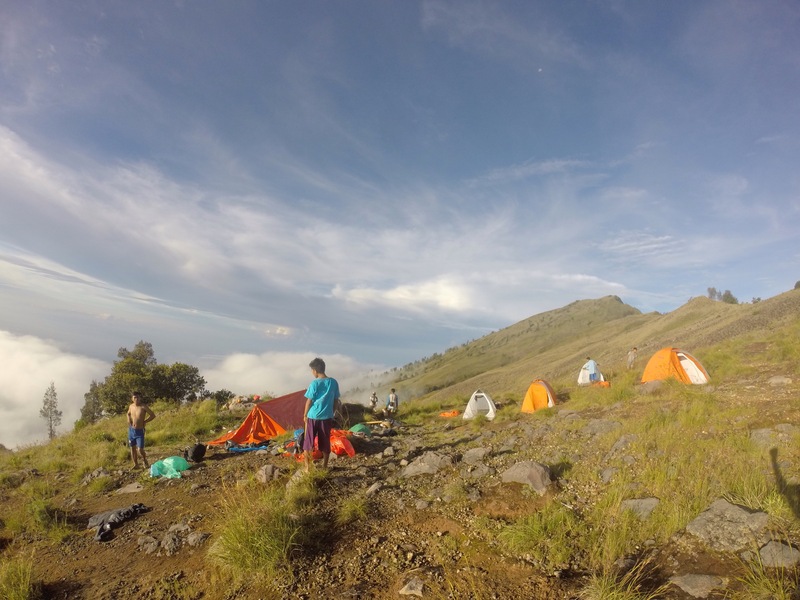 Day 1:Try and make it to crater rim by the end of the day if the rain let up and set up camp before sunset. Day 2: Hike down into the crater, stop at the hotsprings for lunch, and climb back up the other side to pre-summit base camp. Day 3: Wake up at 3am to make the 3 hour ascent to the summit for sunrise and climb back down before sunset. I was just excited for a challenge so it sounded pretty reasonable to me at the time. When the rain let up just a bit, we tossed on our ponchos and began the trek. Signing my name in at the station, I looked at the meager couple hundred figure that represent the American climbers of 2014 and vowed to myself that I would make it( our guide, Andy, had his doubts about us). We all chatted cheerfully for the first hour or so but then dug in our heels as the rain came and our concentration shifted to keeping schedule. It wasn’t going to be a walk in the park. 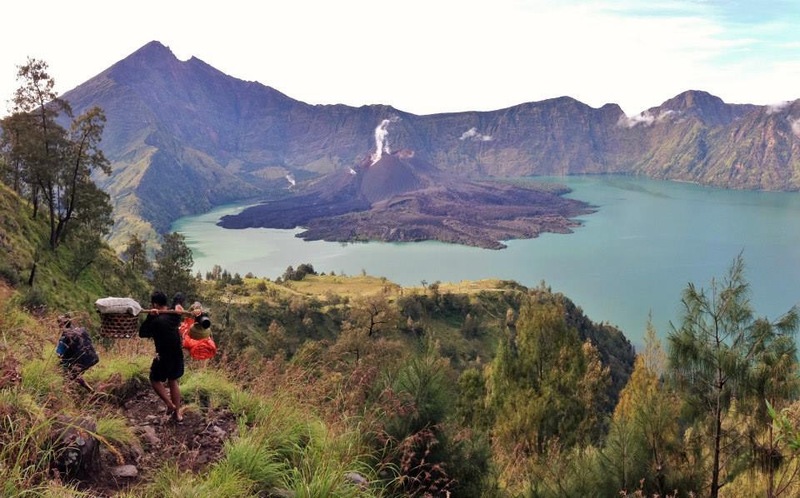 We continued on, occasional silence interrupted by our intrigue in the calf muscles of the tiny Indonesian porters casually hopping along in flip flops, cigarette in hand and carrying who knows how many pounds of camping gear on their backs. Our muscles began to burn and we decided that we preferred the earthen stairs to a gradual but slippery incline in the rain. As I got into a good breathing rhythm and the slope got steeper, I got lost in my thoughts of how I would power through all that was to come in the next few days. I promise not to let myself down. I promise not to let my coaches down. BUT MOST IMPORTANTLY, I PROMISE NOT TO LET THE GIRL BESIDE ME DOWN. I feel lucky to have been blessed with all the circumstances surrounding my four years with my team at Rollins. 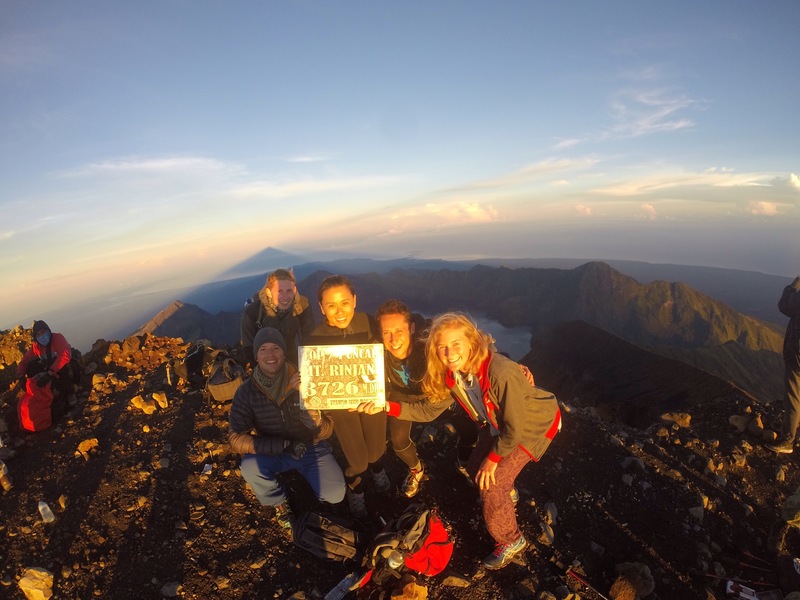 I don’t know the stories of the trekkers I saw on my journey up mount Rinjani, but I couldn’t help but feel that those four years had left me with and advantage, not just on the trek, but in life. In the afternoon of the first day, as the terrain got steeper and slippery close to crater rim, I made a conscious effort to encourage my trek group onward in the same way my Rollins teammates would. I was channeling Carol and Mo telling me you got this piggy on an 8 meter shot, Palaz patting me on the back and telling me to keep my head up on a lost possession, Pags putting me in a headlock(affectionate) at any achievement; I could go on and on. I was channeling this to my trekking buddies maybe not in the same manner but with the same intent. At crater rim, the clouds and rain suddenly gave way to the most spectacular sunset and scenery I’ve ever payed eyes on. I felt like we could have easily been in a setting from Lord of The Rings or Harry Potter. We snapped a couple group pictures and congratulated one another on a successful day one. While eating dinner at camp that evening, clustered together to keep warm, I felt the familiar sense of achieving some sort of challenge with a group again. The italicizes words above are the chant that my teammates and I screamed out, hand in hand, in the huddle before every game. During the challenging part of the trek, those memories kept me going. And then I realized that the same thing had kept me going through every challenge I had encountered in my post grad life. The initial slump, figuring out my purpose/passions, studying for my health coaching certification, packing up and moving to Thailand, anytime I stepped out of my comfort zone. Back in 2008, I sat down with my sister and Coach Short in his office on Rollins Campus. The team was a year old and had not been given much support nor recognition from the school. He emphasized the importance of the team as a family and when he told us of his plans to make it to the NCAA Championship in less than four years, I believed him and knew I had found my team. The years that followed presented not one but two trips to the NCAA finals and a wild and awesomly weird roller coaster of various obstacles, travels, victories, silly memories and countless hours spent sweating in the workout room and on the field. All the while beside my teammate/best friends/sisters. What resonates with me most–the life lesson that has stuck with me ever since is the power of team comaraderie. When you’re feeling down, when your legs/arms feel like they’re going to give out, nothing picks you up and keeps you going than doing it in the company of the people who support you most and are striving for the same thing; knowing that the success of the team is more important than any individual success. Our coach’s cheesy links on a chain metaphor is absolutely the truth. The tears, sweat, laughs and manic cheers I shared with that group of people are something I will never forget. The second day, after a dip in the springs, we had things down. Felix was always powering on and urging us forward. Naomi, Rachel, Ciara and I would stick together and guide each other’s footing and hand placement on some of the difficult rocket parts; each of us taking turns as the lead. Day 3 was an early one with freezing conditions. We had coffee and tried to shake the numbness out of our toes(I slept in three pairs of socks) before Felix surged onward towards the summit. In the race through the dark to make it before sunrise, I lost my group and happened upon a group of 7 just in time before my cellphone light died. “We gained another, I think” someone said during a headcount. I shyly raised my hand and admitted I lost my group and light. They adopted me into their group with little hesitation and made efforts to focus their headlamps so I wouldn’t walk off a cliff. They even offered me biscuits when we took a break to crouch behind boulders out of the chilly wind. As the first ray of sun broke on the horizon, we powered forward. The terrain was a steep incline of dense dirt and it felt much like walking in sand. The support of my adoptive group and memories of my teammates pushed me onward once again…everything I knew they would be saying if they were right there with me. Just before the sun broke over the horizon, I reached summit and was pumped but not surprised to find that Felix had been the first to arrive. I’m not even going to describe the sunrise view at the summit because no words would do it justice. As more and more people arrived congratulations were exchanged, selfies were captured, and we all shared in basking in the succes and the view. We continually promise not to let the girl beside us down. Our day bus to Bagan was no JJ Express. Part of me was just so content that my emergency antibiotics wiped away all that was ailing me the day before, but this was no walk in the park. Prime example of what you can subject yourself to when backpacking. 1) No AC, windows down=dust and suffocating heat. 2) We paid for tickets and fortunately got seats. Not sure what the locals sitting on plastic stools in the aisle were paying. I’ve never been in a vehicle so over capacity, and that says a lot considering I’ve played the clown car challenge with a golf cart many times in my youth. I was certain we were going to topple off a cliff. 3) Aside from Heather and Jessie, I was sitting next to the only other English speaker on the bus. I thought this was a positive until she kept trying to convince me that I had malaria. “My sister had it, just was for the next wave of it. You should really get that checked out.” Just lovely. 4) There was a mother and child sitting in the aisle next to Jessie. At first, Jessie was entertaining the little girl. Mother and daughter got way to comfortable, made themselves at home with Jessie’s neck pillow and before you know it, there are three people sleeping on Jessie’s legs. Throw in the mother’s puke sesh and things start to get real. Poor Jessie… and Heather too who, although in the window seat, had a bout of waterworks in the midst of another minor panic attack. Of course I immediately looked at Heather to gauge her reaction. Always entertaining and she was clearly in no mood. Turns out our jokester guide, So Soe, had brought us to his home village of Krinstaar for some Real World: Myanmar edition. Things escalated very quickly, Jessie and I looked at each other, thought “why not” and hopped out of the van while Heather reluctantly joined a couple minutes later. With the setting sun at our backs and So Soe in the lead, we walked right into the opening parade of a monk initiation ceremony known as Shinbyu. Accompanied by some stares, we wound our way through the village paths with the line of Burmese women and girls, made up and dressed in fancy and traditional garments, carrying gifts and flowers into the tent. We stopped just before the entrance to watch the young monks approach on horseback, dressed very ornately with crowns and make up and clearly the center of attention. This was there day, their rite of passage into the spiritual world of Buddhism. Soon enough, post-ceremony, they would be taken to the monastery, be dressed in saffron robes and have their heads shaved. Unfortunately, we couldn’t stick around for the ceremony(too white and Christian-looking I suppose) but we were invited to join in on the village feast. We sat down with So Soe and were showered with delicious food that I still can’t identify, our bowls being refiled after each bite by two very attentive Burmen. Everyone was extremely welcoming and the festive vibes were contagious. 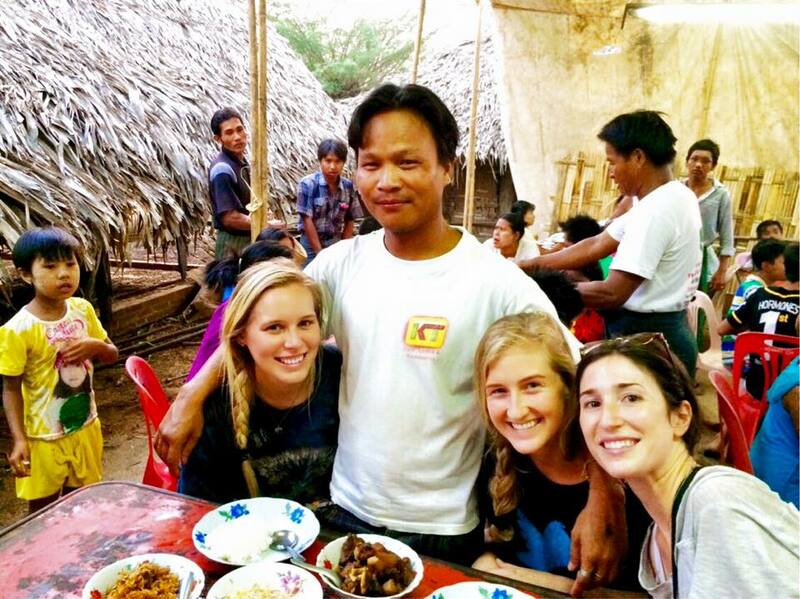 We were officially So Soe’s posse and villager friends were coming up to Burmese fist pound him. Coolest 30 or so minutes of my life. Thanks for letting us intrude Krinstaar village. The rest of Myanmar was a wonderful whirlwind of heat, red ‘desert’ sand, sunrise views, good food and pagoda after pagoda after pagoda. Renting e-bikes the last day was a good move considering uncomfortable bike seats in sweltering heat while wearing conservative/respectful clothing didn’t prove to be the most enjoyable means of exploring. Not playing around about the sunrises though, there’s nothing more peaceful and picturesque than finding an antiquated pagoda to post up on to watch the sun rise over the hundreds of others dotting the old city of Bagan. Maybe only a little jealous of those non-budget travelers who were going up in the hot air balloons, but hey, maybe I’ll be back one day. 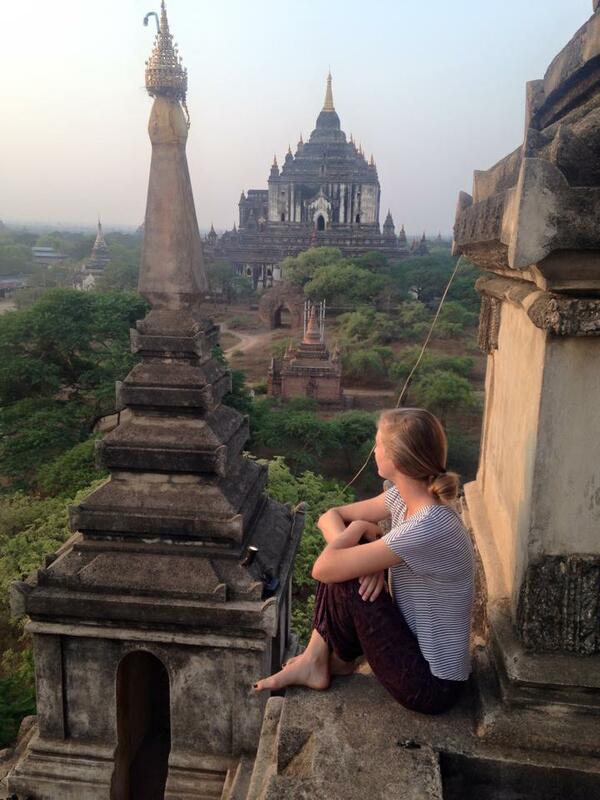 I just feel extremely lucky that I got to experience the culture and see Myanmar before tourism really changes things. Special shoutout to So Soe and OT. Side note* I started writing this post during Songkran in Chiang Mai and meant to post it while in my favorite cafe in Pai until and insane storm swept through the hills and the power/wifi went out(so I read by candlelight until it was safe to leave). This published post is coming to you from Senggigi in Lombok, Indonesia, as an afternoon rainstorm has chased us off the beach. Sorry for the delay mom, I’m still alive. Within the first 10 minutes of my cab ride from Yangon airport, I decided I liked Myanmar. There was something about the hazy orange hue cast over everything by the afternoon sun, all of the “skirt” clad Burmese men and women going about their day and the very welcoming convo with my cab driver, Mr. OT. I was picking up some pretty good vibes. Mr. OT insisted that my six day trip in Myanmar was not long enough. I assured him I would be back. Arrival: I met up with my travel buddies, Heather and Jessie, at Sleep In Hostel in Yangon. First order of business was food(as it always is with me) and we happened upon a Burmese tea house at the end of the street from our hostel. We ate our vegetables and rice and quickly realized that these tea houses are more of a community social hangout than a place to eat. This certain tea house happened to be a little less social seeing as everyone there was seated in their plastic chairs, eyes transfixed by the more recent version of Alice and Wonderland playing on the hanging TV screen. Anne Hathaway and Burma, nice. We wrapped up the evening with a taste of Myanmar lager(thumbs up) and called it a night. Day 1: Early the next day, I called up Mr. OT from the hostel office. An hour later he greeted us outside, smile from ear to ear and waving us down with both hands. He quickly became our favorite person. Myanmar is HOT and it’s summer, so I have to say that it was quite nice seeing Yangon from the inside of an air conditioned car with a native at the helm. I felt bad for the few tourists I saw trying to navigate the traffic and lack of sidewalks by bike. MR. OT dropped us off at 3 Pagodas: Sule right in the city center, Botataung with the sacred hair of the Buddha, and finally the massive and iconic Shwedagon pagoda. Our prayers for tasting actual Burmese food were answered when we were whisked off to a busy and seemingly very popular lunch spot. 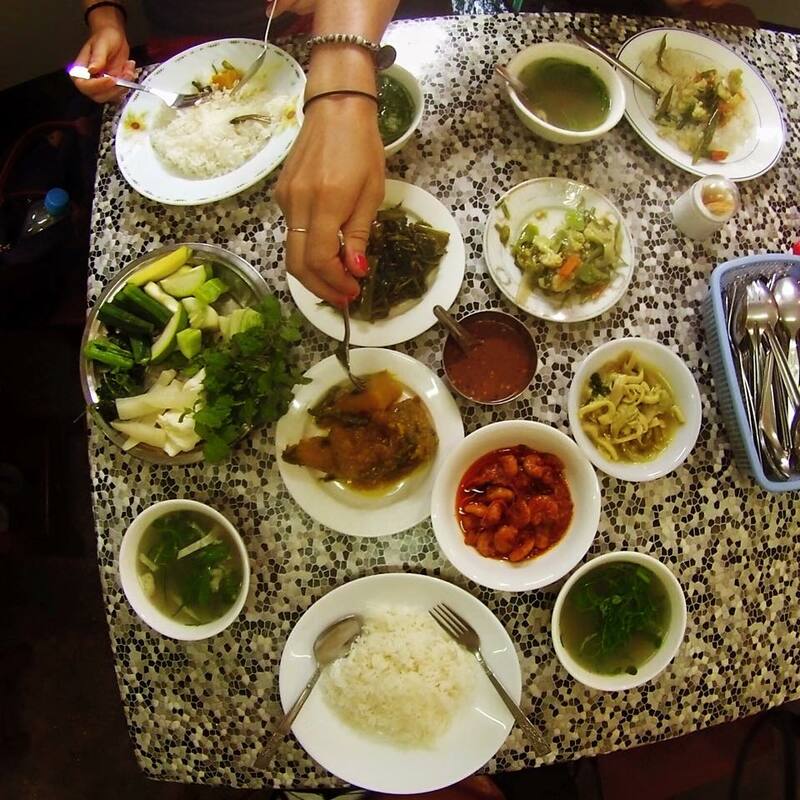 At a traditional Burmese table, people choose a curry or some dish for themselves to accompany the wide range of side dishes to share. We pointed to a few dishes: something pumpkin, a tasty shrimp curry, and a couple dishes of stir fried vegetables. To our delight, a server loaded on the side plates: a plate of rice each(obviously, because Asia) a plate of assorted steamed vegetables with some spicy chili dip, and fish broth stew. Being a group of vegetable lovers, Jessie, Heather and I were huge fans. Burmese food is not as spicy as Thai food and heavy on the vegetables. We rounded off the tour with a walk along the lake and said our goodbyes to Mr. OT. By that point, we were calling him “Dad” based on his tendency of dropping us off at a pagoda and leaving us to linger around at pickup time calling out “DAD”. He would always pop out of nowhere smiling with both hands frantically waving. Burmese people are genuinely extremely nice and have yet to be hardened by tourism. By late afternoon, we were loaded onto JJ Express luxury night bus headed towards Inle Lake. Read previous article for stories on that particular journey. Shortly afterwards, I begin to feel very sick. We all lay down to briefly nap. When Heather and Jessie leave to go on a boat tour of the lake, I stay behind. Of course my first sick day in Asia happens in Myanmar of all places and I start to wonder what they pass as hospitals. Our room becomes my sick ward and I’m just happy that I’m not about to get on a night bus to Bagan. 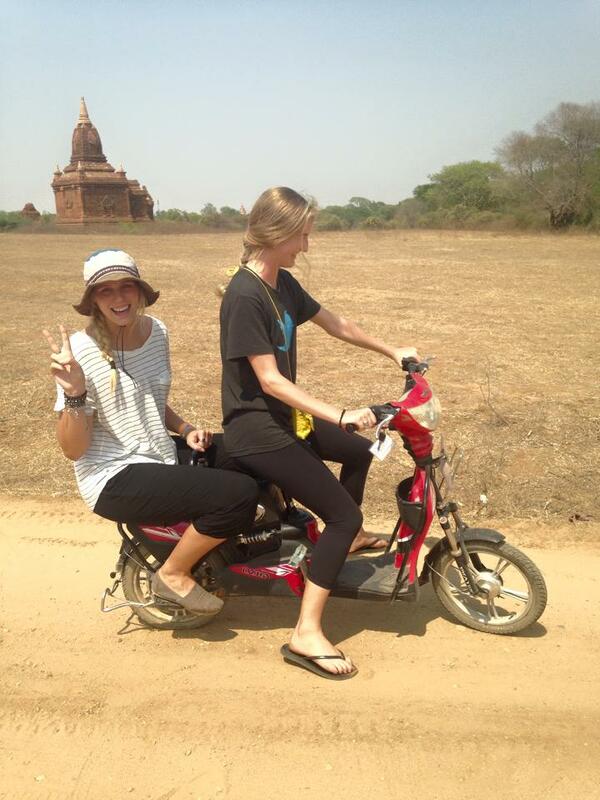 Heather and Jessie said I could take their Inle Lake photos and claim I was there for the tour but I’m a terrible liar. Guess I’ll have to make it back in the future. You win, Mr. OT. Yangon has insane traffic, an equally insane mix in variety of cars and an obvious lack of law enforcement. Our tour driver, Mr. OT, only got in one minor accident, bumping rear-view mirrors in a round about where cars were going every which way imaginable. It’s complete chaos. More visual to keep in mind: many vehicles are pre-war era vans, cars and trucks. The number of little European cars and early Jeeps and humvees zipping around make you feel like you’re watching footage from the History Channel. At this point, these cars are quite decrepit with rusted metal bodies, although they magically still run(their mechanics must be very skilled). Throw into this mix some brand new Hondas and Mercedes Benz, shiny new SUVs(Nissan and Toyota) and luxury buses and things get pretty interesting. There was an influx in the past few years when cars became affordable for the average Burmese and motorbikes were outlawed in Yangon. You can’t talk about Yangon without talking about the traffic. Picture this: young Monks with shaved heads and dressed in their traditional robes, yet wearing backwards hats, converses in hand and talking on their cell phones. This I witnessed at Shwedagon Pagoda of all places, the over 2,000 year old pagoda that towers over Yangon. Everyone who comes to Yangon ends up there at some point or another. The young Burmese guys also seem to go to great lengths to have punk style haircuts. In Bagan, a village boy trying to sell me postcards had a mohawk with blonde frosted tips. Did I mention the trucks pilled high with equipment and HUGE speakers driving around and blasting music as people are hanging off of it. I will never understand how these things occur. Most everyone still wears the traditional “long skirts”. It basically looks like patterned fabric tied tightly around the waist. For men, it’s called a longyi which tends to have a small plaid pattern, and for women, a htamein which has flowery or colorful pattern. Most notably, I got a kick out of seeing Burmese businessmen briskly walking to or from work in their nice button downs and still rocking their longyi with a certain swag. Business on top, party on bottom. Rows and rows of haphazardly placed dilapidated buildings, some colonial era/style, with the occasional luxury hotel thrown into the mix. As we were approaching the looming Shwedagon Pagoda, we passed by a massive fancy condo development with ads boasting about its lineup of foreign investors. The purpose of its being was to have the best view of Yangon and the 2,000 year old pagoda. Go figure. JJ Express. The “JJ” I found out is for “joyous journey”, and I have to say, I was quite impressed. Myanmar night buses put Thailand night buses to shame. We basically had Lazyboy recliners for seats, complete with pop up leg rests, blankets and flat screen LCD TVs. There were TWO uniformed stewards handing out beverages and mini cakes or whatever they were. Keep in mind is spent $20 for this 12 hour journey. AC! Extremely important for comfort factor seeing as it;’s summer in one of the hottest places I’ve ever been. A few hours in, Heather gets up to asks the stewardess where she can find the bathroom. A couple minutes later we stop on the side of the road and the stewardess ushers Heather out to go find a nice spot in the woods. Conclusion: this bus has everything but a bathroom! Rationing of water ensues. Later on in this joyous journey, the bus stops in a parking lot in line with a bunch of other buses. A nice man translates that it will be a 30 minute stop. We pass through the row of buses and come to the most happening and inviting rest stop complex I’ve ever seen. NJ Turnpike step yo game up! I use a nice normal toilet and hope that we frequent these types of places along the way. Back on the road soon after, our pace slows and the bus ride gets bumpy and doesn’t stop. Why are we off the freeway? THEY HAVEN’T BUILT IT THIS FAR YET. Were beginning to go through the mountains and take turns around cliffs with no type of guardrail. The bus stops and honks at times to let other big vehicles pass in the other direction, seeing as the roads aren’t wide enough for two-way traffic at the turns. I wake up at one point to the lights coming on and a line of people getting off the bus. Awesome, i think, we’ve come to another fancy rest stop. Wrong. With a giggle, the stewardess motions for me to join the line of women squatting over a ditch on the side of the road. I shoo away a stray dog to take my territory and I’m sliding in the dirt slope as I’m trying to pee and a truck passing by makes me feel like a deer in headlights. As I’m walking back onto the bus while questioning reality, the stewardess is getting up from her squat and straightening her prim and proper uniform. I was in quite a daze from sleep but I realize later that all of this actually happened. Only in Myanmar. PS Just to clarify, my bus from Bagan had a toilet on it and I still stand by my statement that Myanmar buses top Thailand buses. There is way more of Myanmar I have to share but I though I would give a sense of what it’s like before I get into some adventures. In the meantime, I’m back in Thailand in Chiang Mai for some Songkran festivities(Songkran is Thailand’s New Year and basically a nation wide water fight). Enjoy and keep posted! Chiang Mai, Chiang Rai, Pai and Bali to come as well. A recap of December’s full moon. Saturday, December 6th was a perfect premier full moon party because all the stars basically aligned. Not only was it a Saturday night full moon, but it fell the day after a very important holiday thus enhancing the party atmosphere and making everyone more capable of traveling to the islands. 1. Everything is written in English! 2. So many farangs everywhere ughh. 3. I’ve never seen so many western/Italian/German/Irish/Indian(insert genre of restaurant) food places. Overwhelming. 4. Am I even in Thailand?? 5. Sightly trashy beach town that feel quite familiar to ones back home. I’m not trying to deter anyone from going to Koh Samui, it just doesn’t feel like Thailand especially in comparison to my town of residence. Cons: the beaches are picturesque and the nightlife has potential. I’m not about the resort life but I’ve heard from my mom and sister that it’s a good place for that type of vacation. When Leah and I arrived on Chawang, we walked along the water close to sunset and choose one of the many resort restaurants huddled along the beach. A chill night before the chaos of the following evening ensued. The bars seemed eerily quite but we settled into some lounge chairs at a reggae bar on the beach. After a flash flood, we made our way through the overflowing streets to our hostel-a cozy little place run by a German man and Thai women(relationship status unclear but assumed). We were overly excited. So when we rolled up to sunset beach in Haad Rin around 6:30pm. When we sat down to admire the full moon over the water and crack open our Hong Tong, red bull(the real Asian kind) and soda, we decided to check what time sunrise would be. Answer: in a full 12 hours. Okay, okay so we showed up a little early. The party didn’t really get into full gear until midnight(recommended arrival) but we did decide to put the alcohol on hold and jump a little fire rope which would have been impossible to get a turn at later in the night. We met up with Greg, a friend of mine from Rollins, and his grad school buddies who were seasoned full moon partygoers(when you have been once before, you just know). The north end of the beach had a bar up on the rocks called mushroom mountain. After getting the cliche full moon party neon body paint, we started there with a shake and made our way south down the beach stopping at each DJ stand along the way, choosing our favorite. The beach was one big mass of neon clad farangs dancing around. What was fun to watch were the people on the outskirts of all of this. We posted up on the rock pile at the south end and people-watched the drunk people wobbling aimlessly to the point where I started to feel bad and it wasn’t funny anymore. At one point Greg got down to help one guy who was repeatedly loosing his flip flops in the surf and a French man pranced up and hung with us for a little while to test his English skills. When Leah woke me up shortly after sunrise, there was a neon haze over the beach and smaller groups of dancers still lingering while dazed partiers loaded onto long tail boats or tuk tuks to return whence they came. I have to include myself in the dazed tuk tuk group because all I really remember from the ride back was how everyone was quiet/half asleep/still drunk? and that my stomach was eating my insides I was so hungry. Leah and I were the lone customers at a restaurant by our hostel(we were to early for our hostel breakfast) so we ate and bypassed our hostel beds that we never slept in to go collapse in hammocks on the beach. It was the same beach we cracked open our first full moon beverage on the day before but this time, the beach was eerily quiet and serene. Great nap. Maybe I’m not too terribly upset that I missed this full moon party, just wishing I could be on a beach and experience it with my group of friends who are there now! Good luck guys and pace yourselves! Any health freak like me knows what a health food store feels like. There is some unexplainable vibe and a mixture of scents and earthy tones that, to most, epitomize earthy-crunchy-hippie etc. While most people might roll their eyes, I thrive on these types of places that encourage my fascination with health. I feel at home. I can’t just move to Thailand, pretend I didn’t just study for a year to get my health coach certification, and keep the plates of Pad Thai and fried bananas coming without batting an eye. I started to realize after a month that my “vacation stage” where I eat whatever I want and justify it as “experience” would have to end in order to balance out my weekend benders filled with Hong Tong, Leo, plenty of adventure and lack of sleep. Adding yoga to my weekday routine was a massive help but my diet lacks the leafy greens and veggies, whole grains, nut butters, and superfood smoothies and green juices that I was so accustomed to on a daily basis in the States. So last week, when I walked into a store that appeared like it had potential to be health related(can’t quite articulate why) I was delighted to find my first health food store. Fresh vegetables, AVOCADOS, all sorts of organic foods and beauty products. The women running the store didn’t speak much English but I felt like I knew and understood her. Ok I sound crazy but this encounter/familiar health vibe made me so happy. I now have coconut oil, apple cider vinegar(they have Braggs brand here!) and assorted greens and veggies for salads and my nutri bullet when it gets here. After not eating much meat back home, I couldn’t go with eating chicken and rice with nori broth every morning, so I don’t mind when the Thai teachers laugh at my morning salad and tell me I’m eating rabbit food. Another recent discovery occurred when I went to the islands this past weekend for full moon party. Despite being touristy, or perhaps because they are touristy, Koh Phangan and Koh Samui both have a handful of yoga retreats with detox programs, spas and raw or vegan food restaurants and juice/smoothie bars. I was too busy wreaking havoc on my health until sunrise at full moon party(jumping fire ropes, dancing, drinking shroom shakes, throwing back hong tong and red bull) to check out any of the retreats but I’m definitely going back for an extended stay before the year is up. It’s all about balance.